OutSystems, the open, rapid application delivery platform (PaaS) provider, today released OutSystems Platform 9, which raises the bar for mobile application development. The solution enables any developer to easily and rapidly create and deploy apps across iOS, Android, Windows Phone, and web, from a single application design and code base. OutSystems applications are delivered as open, standard-architecture code and insulate enterprises from future technology changes and vendor lock-in. OutSystems Platform 9 adds a hybrid mobile capability to the OutSystems rapid application delivery platform; a first-of-its-kind visualization tool that dramatically simplifies aggregation and manipulation of data; and powerful integration through a fleet of connectors for popular SaaS and legacy applications. Over 400 enterprise organizations use OutSystems Platform to deliver mobile and web applications an average of five times faster than traditional coding techniques, while virtually eliminating change request backlogs due to a best-in-class life cycle management capability that automates the entire build, test and deployment process. A recent survey of more than 200 US and UK enterprises, conducted by independent insight and research agency Opinion Matters, found that enterprises have a significant mobile backlog. Of the companies surveyed, 85 percent noted that they have a mobile backlog of between 1-20 applications with half having a backlog of 10-20 apps. The goal of these new mobile app initiatives is either to generate revenue (64 percent) or to improve the mobile experience of existing apps (58 percent). The new OutSystems® Now app (see below) is an open source native ‘shell’ that provides deep integration to device sensors and the benefits of an App Store app. Users can create mobile apps that utilize responsive web design (RWD) to automatically render beautifully on any device, form factor or operating system. Visual Aggregates - Brings a first-of-its-kind ability to graphically access, bind and view complex queries in real-time with live data – dramatically decreasing the time and effort to retrieve, aggregate, manipulate, and present data contextually. What would normally take hours of SQL query building and trial-and-error testing is now accomplished in minutes - error-free. Aggregates significantly shorten the time it takes to go from business request to visualization. Pre-built Connectors – A comprehensive set of connectors facilitates access to popular SaaS and legacy applications (Box, Twilio, LinkedIn, Twitter, Zendesk, and much more.). Build Your Own Connectors - Connect to just about anything with powerful yet easy consumption of SOAP and RESTful web services or by leveraging existing Java or .NET code. Provides rich device integration and access to mobile device sensors for OutSystems-delivered responsive web applications. Enables all OutSystems-delivered applications to be launched from a single location and login. Serves as an enterprise app store providing enterprise IT with the ability to manage and control end user access to mobile applications based on role and need from one location or multiple devices. 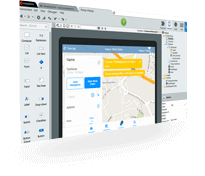 Enables development teams to build one app for all devices - that will render properly on a desktop without OutSystems Now, and then leverage direct access to sensors, such as GPS or camera, when used on a mobile device. Is open source, so it can be branded and extended or modified, while providing the control of a custom environment.